The Tatakai Trio finds Küchen and Lindsjö joined by Stockholm local Raymond Strid (who is a member of Maxcolic with Lindsjö) on drums. Strid, also a regular contributor to the Swedish free improvisation scene, has collaborated with the likes of Mats Gustafsson, Barry Guy, and Marilyn Crispell among others. ‘Cheerful’ starts out with Lindsjö’s clean guitar tones riding on Strid’s rhythmically probing structures. Küchen’s sax starts out inquiringly with clean tones which increase in intensity, reaching full skronk by the 2 minute mark and blazing through to the end of the piece. ‘Grinning’ finds the group dynamics more active early in the track, with the trio quickly establishing their relationships and direction. Lindsjö hits the overdrive pedal shortly after the initial passages, while Strid provides a bed of angular percussion. Küchen spits fire throughout; this cut finds him utilizing his extended techniques to great effect. Lindsjö throws off bits of guitar skree and crunch towards the end while Küchen’s bleating reduces to a whimper. ‘Sunny’ starts off with introspective guitar playing and active drum clatter. The sax joins in in earnest around the one minute mark spurring an increase in intensity from the group which rises and falls over the course of its five and a half minutes. Küchen offers up some seriously vigorous timbres here (and the album as a whole), often times giving his lines a resonating sizzle by blasting his horns into a snare head. ‘Exhilarated’ finds Küchen playing plaintively over Lindsjö’s alternating chords. You can almost discern bits of a 4/4 beat in Strid’s drumming that disappear as quickly as they bubble to the surface. Küchen continues his elegiac statements (which occasionally sprout fangs) over this percussive backdrop. The track ‘Smiling’ starts off at high intensity which almost instantly unravels into slower, more nuanced and sensitive playing by the trio. A dialogue forms by means of Lindsjö and Strid providing porous formations for Küchen to navigate. In the background an electronic cat mews. ‘Joyous’ is a short romp in which Lindsjö’s guitar serves as a sort of lumbering metronome for Strid and Küchen’s rattling percussion and rawboned saxophone wailing. ‘Pleased’ builds to an ecstatic crescendo from its clattering start and finds the trio displaying some new twists to their collective language. 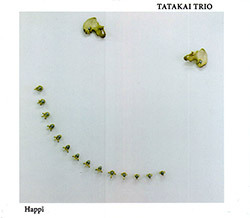 The album rounds out with ‘Jolly’, maxing out the energy level at the start of the last piece with extremely physical playing on the part of the trio. Around the half way mark the background clatter reduces and Küchen is left to screech and squawk over the interlude. The trio returns to a more contemplative approach for the balance of the track, with chimes signaling an end to our good time. This album benefits from a near pyramid-shaped arrangement, with the two longer, more texturally dynamic pieces sandwiched between the shorter, higher intensity ones. This sequencing provides an energetic, engaging overture that sets you up for the more subtle and lengthy pieces before again turning the energy back up to finish things off. Combined with the excellent group rapport and tremendous playing the result is infectious. This is one of my favorites of 2018 so far, highly recommended.